Open Science by Design: Realizing a Vision for 21st Century Research is a concensus study report, undertaken by the National Academies of Sciences. 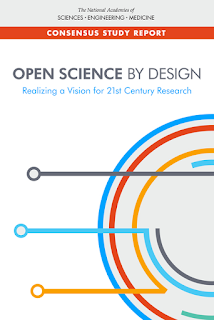 To evaluate more fully the benefits and challenges of broadening access to the results of scientific research, described as “open science,” the National Academies of Sciences, Engineering, and Medicine appointed an expert committee in March 2017, consisting of a range of university members, several publishers and members of publishing organisations. Completed and published last month, this report presents the findings and recommendations of the committee, with the majority of the focus on solutions that move research toward open science. A move mirrored in Europe with the PlanS initiative. The report looks at examples of open science and considers the chjallenges each party involved in the endeavour will face in achieving total openness.